At first glance, it looks like this Iowa man hit the jackpot but much like your rear view mirror, Objects May Appear Larger Than They Are. At first glance, it looks like this Iowa man hit the jackpot but ???? (VO-2) Please zoom in on $1 win? ?Upon closer look maybe not.??(VO-1) ? 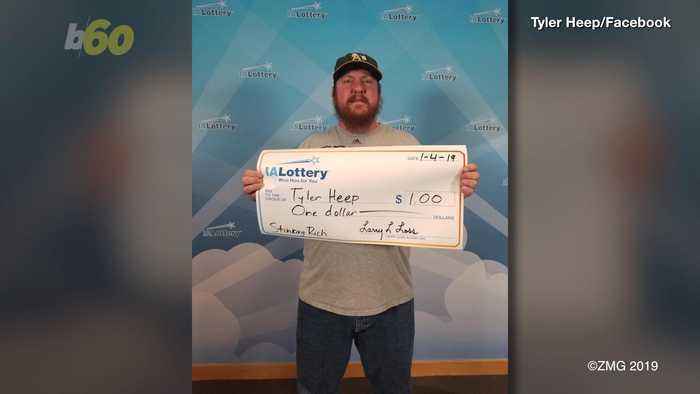 ?Tyler Heep certainly didn’t win the mega-millions — and the closest he could get to 100 Grand would be buying a candy bar with his winnings.??? ?But that didn’t stop him from cashing-in his one dollar….that’s right one dollar lottery scratch off win to Iowa Lottery headquarters.? ?Heep thought it would be ‘funny’ if he requested to be treated like one of the big winners ? ?and receive an oversized check and to his surprise, the Iowa Lottery said yes.
? ?“I figured it would be worth a shot and they all thought it was really funny.” he said on Facebook.
? ?One person jokingly commented on his lottery post “Don't spend it all in one place!”. And Heep is still finding humor in his “winnings”.
? ?When someone commented he should make his Facebook lotto post shareable he replied in jest “No. I don't want random people hitting me up for money.”? ?According to NBC News, he used his 100 pennies worth of winnings to pay for a half a gallon of gas.
? ?Sean Combs once said “It’s all about the Benjamins” ? ?but to Heep it’s all about the Washington.